Turbo pump measurement of the time for a particle to reach the detector, from which the particle size can be determined. In the third chamber, the particle collides with a heated surface that flash vaporizes volatile and semivolatile components. The vaporized species are ionized by electron impact and a quadrupole mass spectrometer is used to obtain the mass spectrum. The detection process is sufficiently sensitive to be able to detect single particles larger than 50 nm, so that the number of particles can be determined as a function of particle size. At present, the full mass range cannot be scanned for one particle so that single-particle analysis is currently not possible with this approach; i.e., a complete mass spectrum cannot be obtained for one particle. Nonvolatile species are also not detected, so that important particle components in soil dust and soot cannot be measured. The advantages compared to single-particle laser ionization techniques are that some of the important volatile and semivolatile components such as ammonium sulfate and nitrate can be quantified. There is also much less fragmentation of organics. (However, given the complexity of the organic composition of particles in ambient air (see Chapter 9.C.2), it is not clear that specific organics in particles will be able to be identified.) Finally, the size and complexity of the instrument are significantly reduced without the need to incorporate a laser. 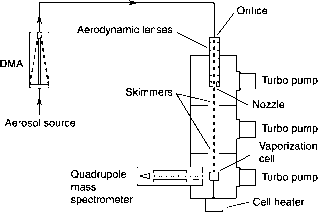 FIGURE 11.74 Schematic diagram of aerosol particle mass spectrometer for measurement of composition of continuous beams of volatile and semivolatile particles (graciously provided by P. Ziemann, 1998). cally in the range of ~ 100-200°C. The particles vaporize in this cell and the vapors are sampled into a quadrupole mass spectrometer with electron impact ionization. The temperature of the vaporization cell can be optimized for particular compounds of interest, so that fragmentation of organic compounds, for example, can be minimized. Sizing of particles in this system can be provided by using a differential mobility analyzer prior to the aerodynamic lenses. Both of these approaches are hence useful for a continuous stream of particles of similar composition where the mass spectrum can be continuously scanned, for example in laboratory environmental chamber studies. In summary, the use of mass spectrometric methods, combined with various approaches to vaporizing and ionizing the particles, is gaining increasing popularity and interest for the analysis of continuous sources of particles or single particles. The problem of quantification of the components seen by single-particle laser ionization techniques remains to be solved. On the other hand, the vaporization approaches can provide quantitative data on some volatile and semivolatile components but cannot measure the nonvolatile species and, at present, do not provide a full mass spectrum for a single particle. As seen in the preceding sections, the technology associated with particle measurement is developing from bulk analyses of chemical composition to that of single particles. Further "splitting hairs," one would like to be able to depth profile particle composition. For example, as discussed in Chapter 9, it is believed that some particles have an organic coating on them, which can affect the particle properties such as the uptake and evaporation of species between the particle and the gas phase. Another example is the surface reaction of NaCl in sea salt particles with gaseous oxides of nitrogen, generating NaNO-,. Whether the surface is coated with a layer of nitrate, preventing further oxidation of the underlying NaCl, or whether the nitrate recrystallizes into separate microcrystallites as suggested by laboratory studies (see Figs. If.63 and 11.64, Vogt and Finlayson-Pitts (1994), and Allen et al. (1996)), leaving a fresh surface of NaCl that can react further, is of interest. Goschnick (1997) applied a combination of X-ray pho-toelectron spectroscopy (XPS), secondary neutral mass spectrometry (SNMS), and secondary ion mass spectrometry (SIMS) to particles collected on a five-stage impactor in the upper Rhine Valley in Germany and found that the surface was enriched in organic compounds as well as ammonium sulfate and chloride. 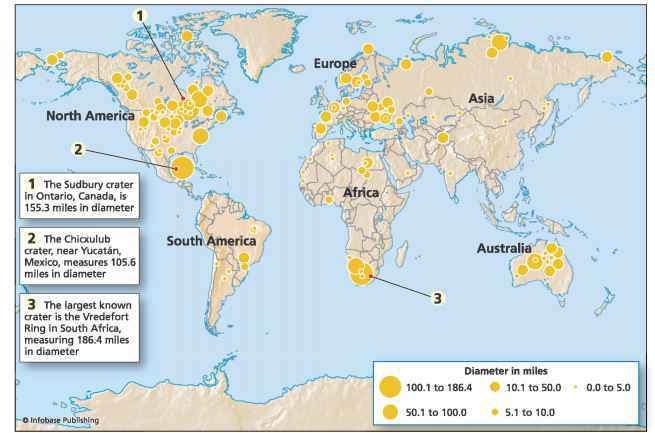 In a suburban area near Karlsruhe, Germany, SNMS and SIMS studies showed that in submicron particles, the cores consisted primarily of carbon (both elemental and organic), whereas the surface was enriched in ammonium sulfate; on the other hand, larger particles with diameters greater than 2 /¿m had cores of alumi-nosilicates surrounded by organics, carbonates, and nitrates and then a surface layer of ammonium sulfate and hydrogen-enriched organics (Bentz et al., 1995a,b). Depth profiling of single airborne particles has been reported by Carson et al. (1995, 1997a), who showed that the use of variable laser fluences in single-particle laser ionization mass spectrometry can be used to probe thin films on particles in laboratory systems. At low laser intensities, only the surface layer is volatilized and ionized, whereas the entire particle can be vaporized and detected at higher intensities. Similarly, Ge et al. (1996, 1998a) have studied the composition of single particles formed from the crystallization of solutions of mixtures of salts such as KCl/NaCl and (NH4)2S04/NH4N03 using single-particle laser ionization mass spectrometry. As the relative humidity decreases, the least soluble salt crystallizes out. With further decreases in the relative humidity, the other salt reaches its saturation and the two salts precipitate out together. The composition of the aqueous phase at this point is referred to as the eutonic composition. Thus, a solid core of the least soluble species surrounded by a mixture of the salts is expected. Ge et al. (1996) analyzed the relative peak heights due to individual components in single particles crystallized from solutions containing mixtures of salts as a function of the solution composition and laser fluence. They were able to establish that for a KCl/NaCl mixture, for example, the surface layer was enriched in the minor component relative to the original solution, as expected.